Tat M. Lok received the BSc degree in electronic engineering from the Chinese University of Hong Kong, and the MSEE degree and the PhD degree in electrical engineering from Purdue University. He was a post-doctoral research associate at Purdue University. 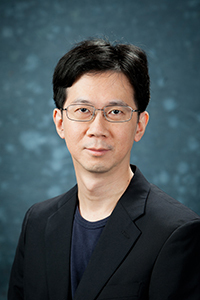 He then joined the Chinese University of Hong Kong, where he is currently an associate professor. His research interests include communication theory, signal processing for communications and CDMA systems. He has served on TPCs of different international conferences including IEEE ICC, VTC, Globecom, WCNC, ISIT, and etc. He was a co-chair of the Wireless Access Track of IEEE VTC 04 Fall. He also served as an associate editor for the IEEE Transactions on Vehicular Technology from 2002 to 2008. S. Shen, H. Fang and T. M. Lok, "Design of Downlink Beamformer for Real-time and Non-real-time Services," to appear in IEEE WCNC, Apr. 2013, Shanghai, China. S. Shen, X. Lin and T. M. Lok, "Dynamic Spectrum Leasing under Uncertainty: a Stochastic Variational Inequality Approach," to appear in IEEE WCNC, Apr. 2013, Shanghai, China. K. Zhou and T. M. Lok, "Resource allocation for secondary users with chance constraints based on primary links control feedback information," EURASIP Journal on Wireless Communications and Networking, Nov. 2012. H. Fang, X. Lin and T. M. Lok, "Power Allocation for Multiuser Cooperative Communication Networks under Relay Selection Degree Bounds," IEEE Trans. Veh. Tech., Sep. 2012. X. Lin and T. M. Lok, "Distributed Power Control for One-to-Many Transmissions in Gaussian Interference Channels," IEEE Trans. Commun., Aug. 2012. C. Y. Ng and T. M. Lok, "Grouping Algorithm for Partner Selection in Cooperative Transmission," Wireless Personal Communications, Sep. 2011. K. Zhou and T. M. Lok, "Power Control for Uplink Transmission with Mobile Users," IEEE Trans. Veh. Tech., Jun. 2011. X. Lin and T. M. Lok, "Distributed Wireless Information Flow Allocation in Multiple Access Networks," EURASIP Journal on Wireless Communications and Networking, Jun. 2011. Kenan Zhou and Tat Ming Lok, "Joint Spectrum Sharing and Power Allocation for Secondary Users in Cognitive Radio Networks," IEEE WCNC, Mar. 2011, Cancun, Mexico. Xingqin Lin, and Tat Ming Lok, "Relay Assignment in Multiuser Cooperative Radio Networks with QoS Guarantee," IEEE WCNC, Mar. 2011, Cancun, Mexico. C. Y. Ng, Kenneth W. Shum, C. W. Sung, and T. M. Lok, "A Layered Decomposition Framework for Resource Allocation in Multiuser Communications," IEEE Trans. Veh. Tech., Feb. 2011.